… that if you just “work hard and play by the rules” you should expect … a decent life and a chance for your children to have a better one. There is just one problem: It’s out of date. … when Clinton first employed his phrase in 1992, the Internet was just emerging, virtually no one had e-mail and the cold war was just ending. In other words, we were still living in a closed system, a world of walls, which were just starting to come down. It was a world before Nafta and the full merger of globalization and the information technology revolution, a world in which unions and blue-collar manufacturing were still relatively strong, and where America could still write a lot of the rules that people played by. That world is gone. It is now a more open system. Thomas Friedman, New Rules, New York Times, : September 8, 2012. Anybody with an idea and a little expertise can set assembly lines in China into motion with nothing more than some keystrokes on their laptop. A few days later, a prototype will be at their door, and once it all checks out, they can push a few more buttons and be in full production, making hundreds, thousands, or more….“Three guys with laptops” used to describe a Web startup. Now it describes a hardware company, too. Voilà, a Factory in Your Garage, Reading File, New York Times, February 6, 2010. Both cyclical and structural effects appear evident in the recession, suggesting that some features of the U.S. economy can benefit from stimulatory monetary and fiscal policy, while others are more permanently damaged and unlikely to respond to such policies. Eric Swanson, Structural and Cyclical Economic Factors, Economic Newsletter, Federal Reserve Bank of San Francisco, June 11, 2012. Richard N. Haass (Director of Policy Planning for the US State Department (2001-2003), To the Victors Go the Foils, Project Syndicate, Apr. 25, 2012. When there are no limits to competition, competition destroys the commons – whether that commons is arable land, fish stocks in the ocean, the earth’s breathable air, or the economy in which all the world’s working people must earn an income sufficient to support a family and contribute to the well-being of their communities. Structural factors that rob working people of living wage jobs are not confinedto the U.S., are not confined to any nation. There are national and local variations, but, fundamentally, the structural problems are global in scope and must be addressed through globally coordinated efforts. A global system in which one nation outdoes others for a few years, and then another nation outdoes others for a few years, while the global trend is greater hardship for the greater number, is not one the American people should want and it is not one in which a high standard of living can be sustained. Posted on September 9, 2012 by Jim LundayPosted in Global Economic Governance, Global Job Creation, Global Workforce TrendsTagged Economic Competition, Employment Trends, Job Growth. Table presented in World of Work Report 2011, International Labor Organization, October 31, 2011, Pg. 9. World of Work Report 2011, ILO, October 31, 2011, pg. 41. Thomas Friedman, One Country, Two Revolutions, New York Times, October 22, 2011. Deloitte: Mid-Market Executives Increase Long-Term Investments Despite Economic Uncertainty, Deloitte Press Release, Oct. 10, 2011. James Manyika et al, Growth and renewal in the United States: Retooling America’s economic engine, McKinsey Global Institute, February 2011. Vlad Savov, Sony CEO Howard Stringer: Every TV set we make loses money, Washington Post (originally published in The Verge), Friday, November 11. Michael Mandel and Susan Houseman, Not all productivity gains are the same. Here’s why, What Matters, McKinsey & Company, June 1, 2011. The transformations in communications, transportation, transnational trade and investment flows, geopolitics, and access to advanced technologies that we summarize with the term globalization have greatly multiplied the number of businesses in every sector of the world economy competing for customers. Moreover, companies are competing for a stagnant number of consumers and consumer dollars. Although the buying power of working families is growing in the countries experiencing rapid economic growth (called the emerging economies), it is declining or barely growing in many of the advanced economies and in many other parts of the world. This is greatly intensifying the competition among the worlds much larger number of competing business enterprises. Investments that only lure consumers to replace one product for another, to replace one consumer activity with another, and/or to buy the same product from a different company only move consumers around in the market place; the net effect on the labor force is job churning not job growth. Overheated global competition will continue to do harm to global job growth until a global policy response creates a mechanism for market sharing and puts boundaries on the use of competitive strategies. Without that response, global rates of unemployment, underemployment, poverty, and political upheaval will continue to increase. And the U.S. will not avoid sharing in these miseries. Posted on November 12, 2011 November 12, 2011 by Jim LundayPosted in Global Job Creation, Global Workforce TrendsTagged Employment Trends, Job Growth, Technology. “Global investors increasingly view risk in binary terms: When things are looking calmer on the global economic front, stock markets rise across the world; when things look scarier, they fall. Instead of differentiating among the economies in the United States, Europe and Japan, market measures are moving closely in tandem. “Concurrent with the shift in power among nation-states, the relative power of various nonstate actors—including businesses, tribes, religious organizations, and criminal networks—is increasing. The players are changing, but so too are the scope and breadth of transnational issues important for continued global prosperity. By 2025, the international community will be composed of many actors in addition to nation-states and will lack an overarching approach to global governance. Over the last several decades, the world’s distribution of economic power has shifted along several dimensions. The distribution of power among nations has become more decentralized (the number of nation-states in the world has doubled since 1950, a number of weaker nations – notably the BRIC countries – Brazil, Russia, India, and China – have substantially increased their positions of power in the world economy, and with the cold war over, the most powerful nations have less ability to dictate foreign and domestic policies to weaker nations). The distribution of economic power between the world of national and multinational governing institutions and the world of global business enterprises has shifted in favor of the business enterprises (.the expansion of the number of competing geopolitical actors in the world economy has increase the number and diversity of investment opportunities available to corporations and investors, increasing their power to play off one geopolitical entity against another and thus limit the willingness of governments at all levels to manipulate flows of capital and goods to favor their own citizens). These shifts in power have wrought a destructive change in the global environment for job creation. Business enterprises operate under very different mandates than do governments. The core mandate for every business is to gain market share, not share market gains; to maximize profits for owners and shareholders, not to maximize general welfare. In the pursuit of that core mandate business enterprises cannot increase employment, pay higher wages, create safer working conditions, pay taxes, or invest in parts of the world where the greatest need for jobs exist, if doing so will alter the balance of competitive advantages in favor of competitors. Incurring avoidable costs seldom enhances competitiveness; cutting costs often does. In a world in which governing institutions lack the power to organize and moderate competition so that it serves the general interest and in which the growth of markets is stagnant, fiercely combative and norm-breaking waves of competition among the world’s 50,000 global corporations and among the world’s millions of globally exposed local businesses and governments are inevitable. Unrestrained job slashing frenzies in pursuit of lower costs are inevitable. Waves of hiring that manage to materialize cannot be sustained. High levels of unemployment and underemployment become the permanent state of affairs. Posted on September 9, 2011 September 9, 2011 by Jim LundayPosted in Global Job Creation, Global Workforce TrendsTagged Economic Competition, Job Growth, Unemployment. Human Development Report 2010 – 20th Anniversary Edition, The Real Wealth of Nations: Pathways to Human Development, p. 42. Even with the economy in a funk and many Americans pulling back on spending, the rich are again buying designer clothing, luxury cars and about anything that catches their fancy. … Many high-end businesses are even able to mark up, rather than discount, items to attract customers who equate quality with price. Stephanie Clifford, Even Marked Up, Luxury Goods Fly Off Shelves, New York Times, August 3, 2011. 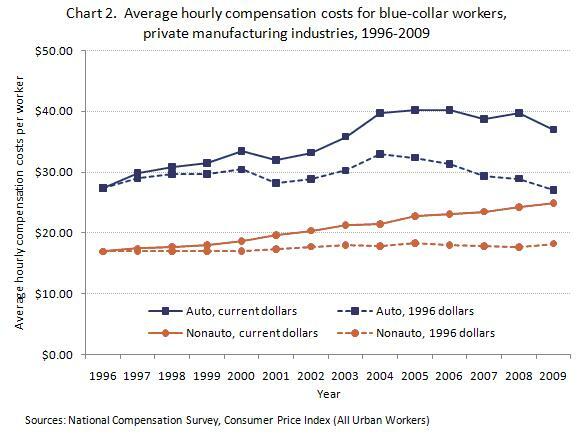 Chart source: Richard Wallick, Auto Industry Labor Costs in Perspective, Bureau of Labor Statistics, Originally Posted: April 22, 2011. Increased global spending on yachts, private planes, high end sports cars, multi-million dollar homes, $200 per person meals, and other luxury items does produce a number of new jobs in the world economy – but not many. Income growth for the world’s middle and lower income working people does the heavy lifting for global job creation. Increases in spending by middle and lower income families send huge numbers of the world’s global corporations, neighborhood businesses, and governments looking for new employees. No real income growth for the world’s middle and lower income families translates into insufficient growth in demand for the increasing volumes of goods and services that can be produced by the world economy, and from there almost directly into no progress in the U.S. on reducing unemployment and underemployment. The U.S. is deeply enmeshed in a demand starved world economy and U.S. economic policy does not directly address that aspect of our situation. Posted on August 8, 2011 by Jim LundayPosted in Global Job Creation, U.S. Workforce TrendsTagged Consumer Demand, Income Growth, Job Growth.